Got him home just before dark. Haven't been able to post any pictures but started using Firefox browser and my post image is back so here goes trying to post. 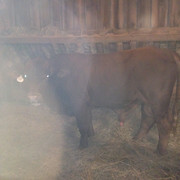 They pictures aren't good as they are from in our barn after dark, will try to get better one when he is turned out. You run an interesting operation Ky hills. do you have my phone???? TennesseeTuxedo wrote: You run an interesting operation Ky hills. We have tried some different breeds on a small scale over the years, in large part to keep it interesting I suppose. 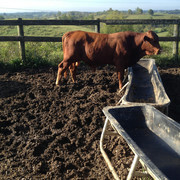 Still running an Angus and Hereford bull as well on our primarily Hereford cows. Our Hereford and % Brahman cross cows seem to do well, and raise some nice calves, but there aren't a lot of them close around. So we thought we would try to raise some of our own. callmefence wrote: do you have my phone???? looks like my pics. must be the same model..
Congrats! Looking forward to see what he does for you. Got a few more pictures this morning, not sure if they are much better. Looks like he's been chasing tail. [quote="Ky hills"]Got a few more pictures this morning, not sure if they are much better. Ky hills wrote: Got a few more pictures this morning, not sure if they are much better. I won't disagree, but have never claimed to be an expert. I will take exception to the stinking comment though, I have already had 1 bath today and before bed I will have another. Digging potatoes.